Book a stay that's as good as gold at Courtyard San Francisco Downtown. Situated in the heart of one of the country's most vibrant cities, our hotel offers quick access to an array of attractions. Visit nearby AT&T Park for a Giants game, head to the Embarcadero Center for premier shopping, and attend a conference at the Moscone Center. A BART station is just blocks away, making it easy for you to get around town. When you're not out exploring all that the Golden Gate City has to offer, enjoy convenient amenities and unparalleled customer service at our Downtown San Francisco hotel. Savor delectable American cuisine at our two on-site restaurants, or grab something to go from our 24-hour Market. Work out in our well-equipped fitness center, swim in our indoor pool or gather a group in any of our 20 sophisticated event venues before retiring to spacious accommodations boasting free Wi-Fi, gorgeous views and comfortable bedding. 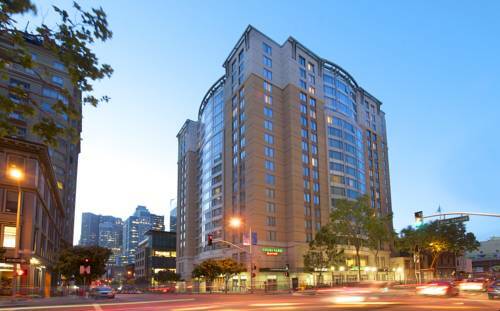 Book a stay at our San Francisco hotel near the Embarcadero today! Downtown San Francisco breakfast restaurant featuring a buffet with made to order omelets. Open M-F 6:30am-9:30am, Saturday & Sunday: 7:00am-11:00am. Offering evening TO GO service. Operating hours: 4:30 pm-11:00 pm daily. Kitchen serves food from 5pm-10:30pm daily. Full retail store offering specialty coffees, pastries, salads and sandwiches.